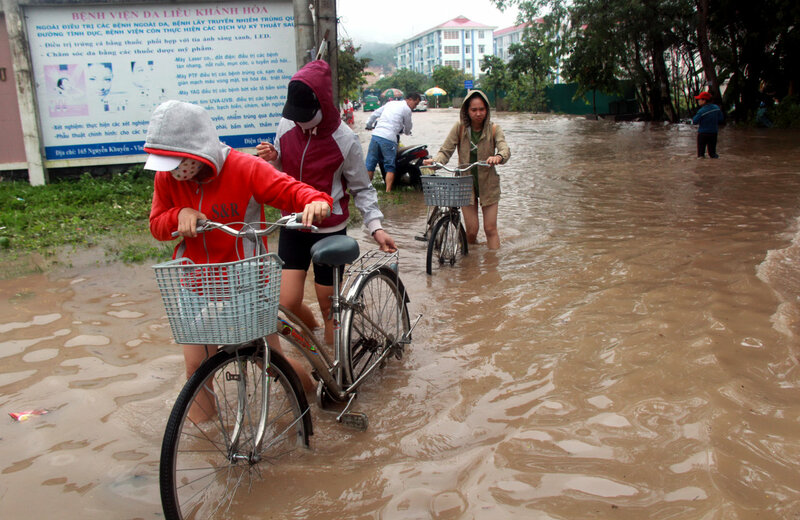 People push their bicycles on a flooded street in Nha Trang City, located in the south-central province of Khanh Hoa. Nha Trang, a famous beach city in the south-central Vietnamese province of Khanh Hoa, has been devastated by a destructive flood, which damaged many streets and houses and caused landslide at multiple locations. The flooding struck the resort city on Tuesday morning, causing an estimated damage of about VND100 billion (US$4.4 million), with competent authorities still struggling to deal with the disaster by 5:00 pm the same day. At the Hon Xen residential area in Vinh Hoa Ward, which suffered the heaviest damage, rocks washed down from the mountain covered various streets and destroyed at least three houses while damaging some ten others. Nguyen Quang Hung, a 36-year-old resident whose house has been brought down, said his family were sleeping on Monday night when flood water submerged their house. A large number of rocks hit the residence about ten minutes later, piercing through one of its wall and burying furniture, Hung recalled, estimating damages of up to hundreds of millions of dong (VND100 million = $4,438). “We were unable to get out of the house as water had reached our loft at the time,” the man stated. According to Tran Van Dong, chairman of the Vinh Hoa administration, the serious flooding and landslide were brought about by the rupture of a canal, accompanied by rapid torrent from local streams. Two people have lost their lives during the flood, including a 14-year-old boy, who was washed away by flood water, and a 22-year-old man, who was electrocuted while tidying his house after floodwater subsided. Mudslide brought about by the flood has blocked a section of the National Highway 1 in Khanh Hoa. Massive rocks have also buried a part of the north-to-south railway, causing several trains to halt their journeys. Traffic resumed on the evening of the same day as the rocks and mud had been removed. The torrential rain has inundated many streets in Nha Trang, including Nguyen Khuyen, Dien Bien Phu, and others, which were submerged under 0.5 to 0.8 meter high floodwater. A large amount of rocks were washed down on the campus of the Nha Tran University and a section of Pham Van Dong Street, blocking traffic and causing congestion in the morning.